Real estate agents can showcase new and transferable skills on their resumes to make a career change into interior design. 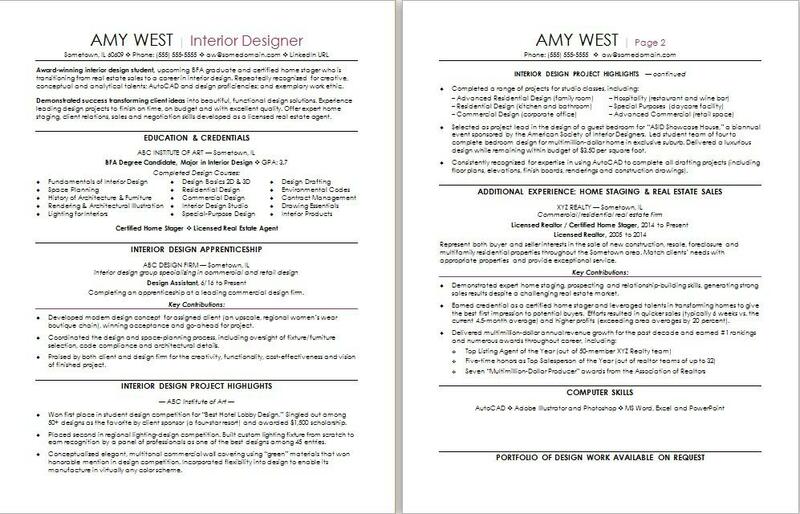 To learn how, view the sample resume below and download the real estate-to-interior design career change resume template in Word. And if you need more help, get a free resume evaluation from the experts at Monster's Resume Writing Service. Jobs for interior designers are projected to grow by 4% (or 2,900 jobs) from 2016 through 2026, according to the Bureau of Labor Statistics (BLS). You’ll find the highest level of employment for this job in the following states: California, Florida, Texas, New York, and Illinois; and in the following metropolitan areas: New York City, Los Angeles, Chicago, Atlanta, and Dallas. In this job, you can expect to make a median wage of $51,500 per year, or $24.76 per hour, according to the BLS. Additionally, you can learn more about real estate careers on Monster. Award-winning interior design student, upcoming BFA graduate and certified home stager who is transitioning from real estate sales to a career in interior design. Repeatedly recognized for creative, conceptual and analytical talents; AutoCAD and design proficiencies; and exemplary work ethic. Demonstrated success transforming client ideas into beautiful, functional design solutions. Experience leading design projects to finish on time, on budget and with excellent quality. Offer expert home staging, client relations, sales and negotiation skills developed as a licensed real estate agent. Completing an apprenticeship at a leading commercial design firm. Developed modern design concept for assigned client (an upscale, regional women’s wear boutique chain), winning acceptance and go-ahead for project. Coordinated the design and space-planning process, including oversight of fixture/furniture selection, code compliance and architectural details. Praised by both client and design firm for the creativity, functionality, cost-effectiveness and vision of finished project. Won first place in student design competition for “Best Hotel Lobby Design.” Singled out among 50+ designs as the favorite by client sponsor (a four-star resort) and awarded $1,500 scholarship. Placed second in regional lighting-design competition. Built custom lighting fixture from scratch to earn recognition by a panel of professionals as one of the best designs among 45 entries. Conceptualized elegant, multitonal commercial wall covering using “green” materials that won honorable mention in design competition. Incorporated flexibility into design to enable its manufacture in virtually any color scheme. Selected as project lead in the design of a guest bedroom for “ASID Showcase House,” a biannual event sponsored by the American Society of Interior Designers. Led student team of four to complete bedroom design for multimillion-dollar home in exclusive suburb. Delivered a luxurious design while remaining within budget of $3.50 per square foot. Consistently recognized for expertise in using AutoCAD to complete all drafting projects (including floor plans, elevations, finish boards, renderings and construction drawings). Represent both buyer and seller interests in the sale of new construction, resale, foreclosure and multifamily residential properties throughout the Sometown area. Match clients’ needs with appropriate properties and provide exceptional service. Demonstrated expert home staging, prospecting and relationship-building skills, generating strong sales results despite a challenging real estate market. Earned credential as a certified home stager and leveraged talents in transforming homes to give the best first impression to potential buyers. Efforts resulted in quicker sales (typically 6 weeks vs. the current 4.5-month average) and higher profits (exceeding area averages by 20 percent).